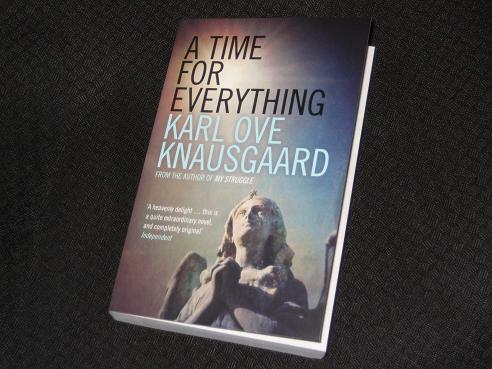 A Time for Everything (translated by James Anderson, review copy courtesy of Portobello Books and Australian distributor Allen & Unwin) is a slightly revised version of an earlier edition (A Time to Every Purpose Under Heaven), with no difference except for a return to the original Norwegian order of the early pages. In his second novel, Knausgaard turns his undoubted attention to detail to a topic slightly less personal than that which many readers will be used to – the nature of angels. I was slightly disappointed by the most recent of Knausgaard’s odes to his youth, so this was the perfect way to move on from that. A Time for Everything is a wonderful book in which the writer makes great use of his style of meticulous analysis and an inability to leave any intriguing aspect of a story undiscussed. The prose in general is excellent too, with Anderson producing a flowing, expansive text that never feels clumsy or forced. With such an eye for detail, the writer is able to bring events off the page, breathing colour into what could be dry, turgid tales. Then, of course, he proceeds to do exactly the same thing himself in his stories – what follows is less biblical and more Thomas Hardy in its bucolic descriptiveness (or George Eliot in the focus on thoughts and motives). We then move on to The Flood, which in Knausgaard’s hands again becomes a sweeping epic. It’s a moving drama, one which often leaves Noah hammering away at his Ark, instead focusing on the plight of the rest of humanity. As the rain keeps on and the sea levels rise, with tidal waves and floods chasing them higher and higher, a small group of people do their best to reach sanctuary. Much of this section focuses on the back story of Noah’s family, and with this knowledge in mind, the well-known ending packs an even bigger punch. As much as it’s a Bible story, it’s one of struggle, with people trying to carve out an existence in the face of disaster – and very moving it is too. These two sections are detached, neutral narratives, but in other places Knausgaard uses a very different style. For example, in his retellings of the stories of Lot and Ezekiel, the writer narrates the events, providing a running commentary along the way. He examines each word, stopping to question the motives, not only of the people but also of God and his representatives, and the way he steps back and ponders events allows us to see the stories in a new light. “What’s going on, Dad?” says one of the daughters. “But it’s the middle of the night!” says the other. The key point here is the question as to what actually angels are – are they closer to God or humanity? Are they eternally the same or capable of change? Bellori and Knausgaard have their own personal insights into the matter, leading to a shocking conclusion (one, again, I won’t reveal here). And yet there’s more… Knausgaard’s Coda, a War and Peace-esque appendage to an epic story, takes place in Norway in the late 90s, where a certain Henrik Vankel (a very thinly veiled Knausgaard) is living in solitude on a small island. It might seem a bit of overkill after the main event, but it does serve a couple of purposes. Firstly, it puts the theory into practice, showing how a man’s life can be rendered meaningless in light of the revelations explained in the main part of the book. Secondly, it’s fascinating for the reader of the My Struggle series, containing future echoes of Knausgaard’s more autobiographical books. As well as touching on issues such as self-harming, conflict with a father figure and deliberate isolation, fiction begins to blend into real life as A Time for Everything is what he was working on during the period covered by A Man in Love. We can see why he was so driven, and frustrated, at anything, including his family, that got in his way during a time of intense productivity.